The update to VLC 2.0.3 is a strange one. It has been released exclusively for Apple Macintosh systems yesterday introducing support for the latest version of the Mac OS X operating system Mountain Lion. Mac users furthermore benefit from stability improvements that the Videolan developers made in the new version. VLC Media Player 2.0.3 lastly includes improvements for 18 interface translations, and support for the two languages Marathi and Uzbek. But what about Windows? Microsoft Windows users who check for updates in the player will notice that none are picked up by the update check (You can check manually for updates with a click on Help > Check for Updates). 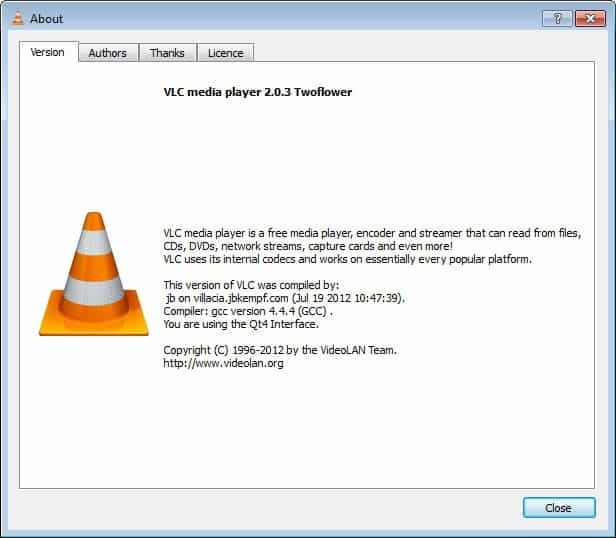 The version of the player on the about page is still listing VLC Media Player 2.0.2 Twoflower, with no word about version 2.0.3 of the player. According to Videolan, the update will not be made available to Windows users via the player's automatic update feature. If you stop by the VLC Media Player project website you will however notice that VLC 2.0.3 is available for Windows there. If you are a Windows user with VLC 2.0.2 or earlier, you can update to VLC 2.0.3 manually by downloading the new client version from the website. The player won't install over the old version and if you go through with the installation, you will uninstall the old version of the program before the new version gets installed on the system. Should you update to VLC 2.0.3? If you use a different interface language than English, or are a native speaker of Marathi or Uzbek, then it may make sense to update for better native language support. If you do not, there is not really a reason to update to the latest version of the media player. The next version of the program will be delivered as usually then via the program's automatic update feature to make sure you do not miss an important update for your operating system. VLC 64 bit is still in version 2.0.2.